I hope you guys had an amazing Christmas! I spent mine eating a lot, watching The Holiday and browsing the online sales. Like the Black Friday sales, the Christmas / Boxing Day / January sales start earlier and earlier each year (not that I'm complaining!). I'm trying to only buy things that I need and know that I will wear instead of buying things just because they're on sale. In fact, two of the items that I picked up in the sales feature in this outfit: the Fendi 'Iridia' sunglasses and the Office Chelsea heeled boots. I've always admired the Fendi sunglasses from afar but couldn't justify the hefty price tag as they're a pair of statement sunglasses, so I wasn't sure how much wear I would be able to get out of them. They look similar to the Alexander Wang for Linda Farrow cat eye sunglasses that were popular a few years ago, but with a less futuristic and severe shape, which I find more wearable. When I saw the black version with gold metal tips go on sale for 50% off, I was surprised because classic or signature designs rarely, if ever, go on sale. I thought there was no harm in ordering and trying them out. When I put them on, I was sold: they instantly add some pizzazz to any outfit. I'm more adventurous with accessories, especially sunglasses, because I think they're a subtle way of elevating an outfit. As you can see from how much I love and wear my Quay Australia marbled sunglasses, I'm a huge fan of statement sunglasses. Unfortunately, the black version with the gold metal tips is now sold out, but the pink version with pink metal tips, which is equally as gorgeous, is on sale. As for the Office boots, they're reduced from £65 to £46. I like Chelsea boots because of their classic and simple design as well as the fact that they're so easy to put on and take off (no faffing about with laces!). The boots have a low and chunky block heel, which gives me a boost of height (handy when you're as short as I am) while still being comfortable enough to walk all day in. This outfit is basically a homage to my love for menswear and tailored pieces. 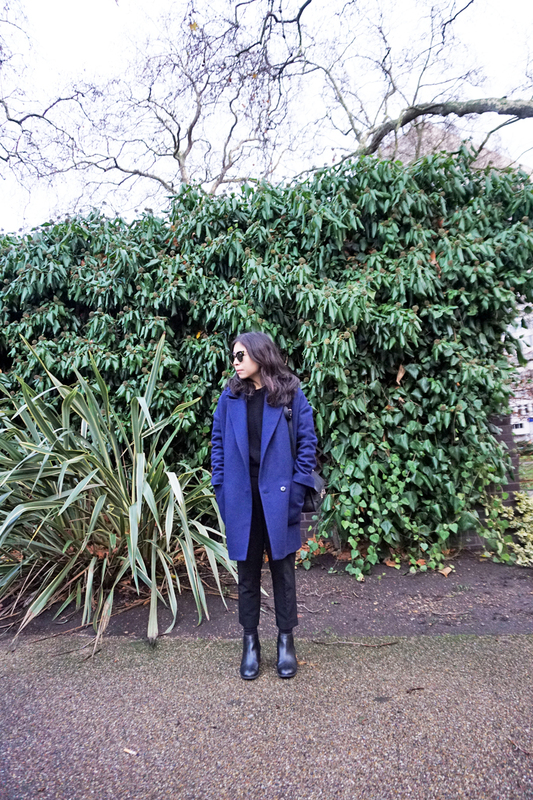 This Topshop Boutique coat is aptly named the Mensy Coat, and I adore its boxy fit and streamlined cut. I usually don't size down when I buy oversized clothes as I like the oversized look but if you're thinking of getting the coat, I would recommend sizing down because I was practically drowning in my normal size. Unfortunately, it's also sold out online but you might be able to find it in the stores and I've linked a similar one below. 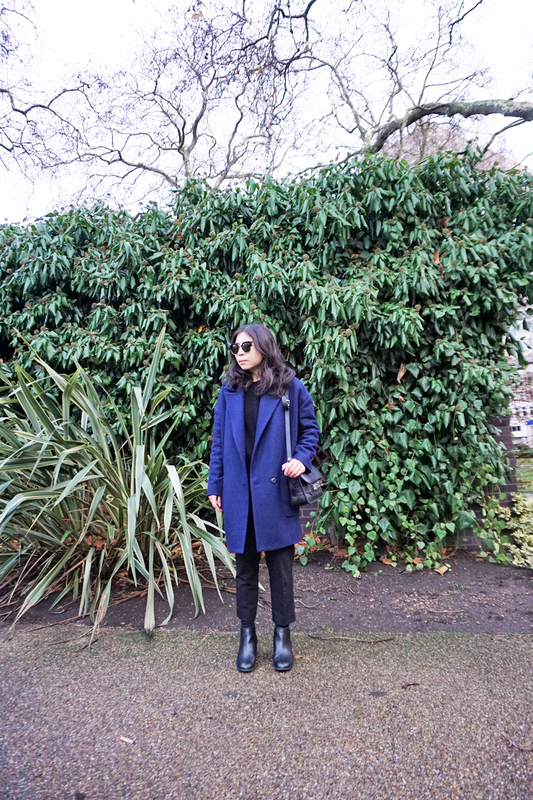 The coat is in a deep but vibrant shade of navy blue, so I paired it with black clothes and accessories to really make the colour pop. I've expressed my love for cigarette trousers in the previous outfit post, and I think they match the androgynous and tailored look of the coat well.